At the Royal Opera House Covent Garden I found my friends Danuta and Ann, and we chatted a bit before the opera started. We all agreed that the original Swedish version is the best and most sensible version. At Verdi's time it was to daring to have a monarch (King Gustavus III of Sweden) assassinated on stage, a true historic event. The love story is a invention of course. But in London it was the Boston version, Gustav III had become Riccardo, Governor of Boston. The director even "updated" it to the era of the Civil War which really was not an improvement. Luckily that was not too oblivious. Although the singing was good in act 1 it was not very exciting. It was rather dull. The Ulrica scene, always a difficult scene to get right, was severely hampered by the fact that Elisabetta Fiorillo (Ulrica)'s voice was not a truly big voice, not deep enough, and the Legato line was missing. The staging was not too bad here, but without the a deep-voiced with incredible breath-control (which I feel Ulrica HAS to have) she was not believable in having connection with Satan (Re d'Abisso). Marcelo Alvarez as the governor pretending to be a sea-man was good, maybe even great. But I felt that in Scherzo ed Follia, he didn't react like I believe he should, either more defiant or more good-humored. I do like Karita Mattila's voice but there are something about this always beautiful voice she got, very beautiful lines, soft and gentle although somewhat big voice. Or I always thought her voice was big, maybe it never was big, or maybe it isn't anymore. Such beauty in a voice, so unbreakable, can be less than dramatic. No edge in he voice, which is needed when she distraught meets Ulrica, desperate to no longer feel such love/passion for Riccardo, Governor and best friend of her husband. In act 2 where is in the terrible place where criminals are put to death, she is very good, very dramatic. I hated the scenography in this scene. All that rubble on the scene (where could plants exist. It was a bad idea. But when great singer like Mattila and Alvarez sings, acts, nothing can destroy it. The director had directed them to a very strange choreography but this was an idea that was working. It was so much passion there so this strange dance seem right for someone on the edge of being totally crazed by passion. I will not say much about Thomas Hampson as Renato, husband of Amelia (Karita Mattila), secretary and best friend of Riccardo (Marcelo Alvarez), he was filling the role very well, his voice, acting was good but not excellent. 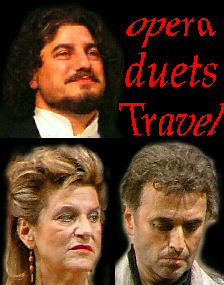 Mattila & Alvarez had their moments of excellence. But never the less, his big aria was well received by audience, and maybe I am too critical when I say that he only touched excellence her (Eri tu), but his acting was really good at this point. 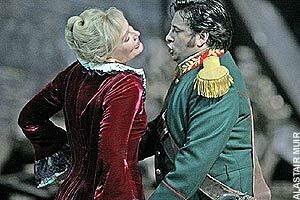 But Karita Mattila was truly amazing, excellent in her arias, but in act 2 & 3. It was highlight of the evening.